Q 12 = 4 A 1 σ b (T 14 – T24) [A 2 – A 1 F 122/A 1 + A 2 – 2 A 1 F 12]. Q 12 = A 1 σ b (T 14 – T24) [A 2 – A 1 F 122/A 1 + A 2 – 2 A 1 F 12]. Q 12 = 3 A 1 σ b (T 14 – T24) [A 2 – A 1 F 122/A 1 + A 2 – 2 A 1 F 12]. Q 12 = 2 A 1 σ b (T 14 – T24) [A 2 – A 1 F 122/A 1 + A 2 – 2 A 1 F 12]. 3. What is the unit of coefficient of radiant heat transfer? 4. Consider radiative heat transfer between two large parallel planes of surface emissivities 0.8. How many thin radiation shields of emissivity 0.05 be placed between the surfaces is to reduce the radiation heat transfer by a factor of 75? 7. Which of the following have a continuous spectrum? 8. The value of shape factor depends on how many factors? 9. Two large parallel planes with emissivity 0.4 are maintained at different temperatures and exchange heat only by radiation. 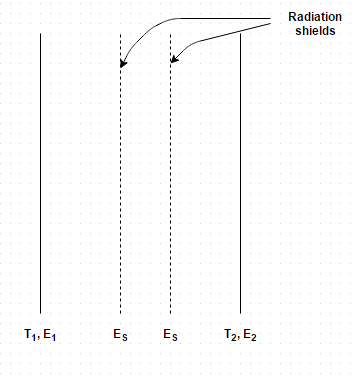 What percentage change in net radiative heat transfer would occur if two equally large radiation shields with surface emissivity 0.04 are introduced in parallel to the plates? 12. How many types of convection are there? 18. What is the geometric factor for concentric spheres? 20. What is the shape factor of hemispherical surface closed by a plane surface of diameter d?